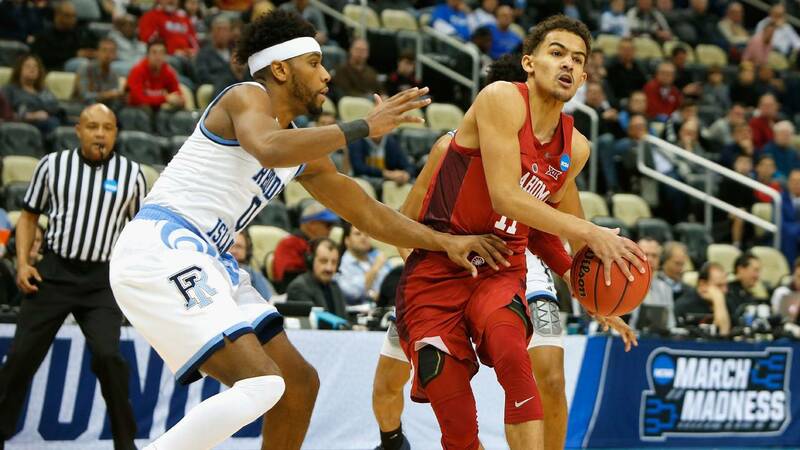 Oklahoma guard Trae Young handles the ball during the Sooners' first-round loss to Rhode Island in the NCAA Tournament. Oklahoma freshman guard Trae Young announce Tuesday he is declaring for the NBA draft. The 19-year-old is making the move after a season that saw him lead the nation with 27.4 points and 8.7 assists. The 6-foot-2 guard announced his decision with a tweet Tuesday morning and also shared the reason for his decision in a post on ESPN described as "as told to Adrian Wojnarowski." "In the end, I have to make the decision that I believe is best for me, but it doesn't mean I do so without a heavy heart, without some regret that we won't get to run it back together next season," Young said of his one season as a Sooner. The Norman, Oklahoma, native decided to stay home when choose his college team and helped the Sooners improve from 11-20 in 2016-17 to 18-12 during the 2017-18 regular season. Although Oklahoma reached as high as No. 4 in the AP Top 25, the team slumped in the second half of the season, dropping seven of their final nine regular season games before losing to Oklahoma State in the opening round of the Big 12 tournament. Young's brief college career came to an end after he posted 28 points and seven assists in the Sooners' 83-78 overtime loss to Rhode Island in the first round of the NCAA Tournament.